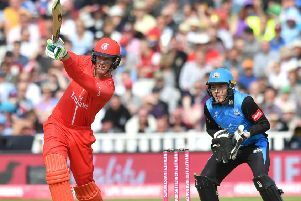 Liam Livingstone has spoken of a campaign of progression after Lancashire’s semi-final exit from the T20 Blast at Edgbaston on Saturday. Lightning were beaten by eventual winners Worcestershire Rapids, who defended a target of 170 to win by 20 runs, riding on four wickets from up and coming seamer Pat Brown. Captain Livingstone bemoaned two costly overs with the ball as the main reason for the Red Rose’s demise. He conceded 23 with his off-spinners in the third over, all but one of which were struck by Moeen Ali before, in the 19th, Toby Lester conceded 27, with Ben Cox hitting three sixes and a four. Overall, Lancashire qualified out of the North Group for the first time since they won the competition in 2015. They finished third in the group before beating Kent in the quarter-final at Canterbury last month. Leg-spinner Matthew Parkinson claimed 25 wickets from 15 matches, a haul bettered only by Worcester’s Brown, who finished with 31. Alex Davies also impressed with 534 runs, including a club record six fifties. No Lancashire batsman has ever recorded that many in a Blast campaign. “We’ve played some good cricket throughout the tournament,” said Livingstone. “We’ve had a few hiccups here and there, but have come back strongly from them. “Throughout the campaign I’ve been really pleased and proud of how the lads played. Last week proved to be a nightmare week for Lancashire, who were also beaten in the Roses County Championship match against Yorkshire at Headingley, a result which all but consigned them to relegation. They cannot be mathematically relegated this week when they have no fixture, but it would take an escape even Harry Houdini would see as unlikely for them to be playing Division One cricket next season. Preferring to reflect on their T20 campaign, however, Livingstone added: “T20 cricket has been a real positive for us. We’ve played some really good cricket. In terms of the Championship, Lancashire are second-bottom and above only Worcester in the Division One. They are 14 points behind third-bottom Yorkshire, who have two left to play to Lancashire’s one. Livingstone and Co wrap up their campaign against Hampshire at the Ageas Bowl, starting next Monday.